Flow measurement devices are used everywhere, where liquids are used: in the water and sewage industry, food and drinks manufacturing, in power stations or in pharmacies. Badger Meter Europa GmbH in Neuffen, Germany is the market leader in the area of magnetic-inductive measuring devices. Just like everywhere in the industry, Badger is under enormous cost pressure. But thanks to a Lapp innovation, it has managed to considerably optimise production costs. The new Badger Mod-MAF M 2000 transducer uses the innovative SKINTOP® CLICK cable gland. The assembly time is therefore significantly reduced, which works out as a $3 saving per unit. The best way to see what is special about the SKINTOP® CLICK is to compare the cable gland system to conventional systems: until now, a locknut and pliers were needed to place the cable glands. Furthermore, a ‘stat-o-sil’ seal was mounted before the cable glands could be screwed tight. SKINTOP® CLICK is simply clicked into the easily deepened drilled hole and the nut is quickly turned to the left. Then the cable is fed in, the domed cap nut is turned shut and that’s it! The cable is fixed, centred, protected against vibrations and pulling (according to EN50262), and hermetically sealed (IP 68). SKINTOP® CLICK is, therefore, generally well suited to all applications in tight spaces and with a wall thickness of 1-4 mm: control cabinet construction; measuring, control and electronics technology; automation technology as well as plant, apparatus and control construction. 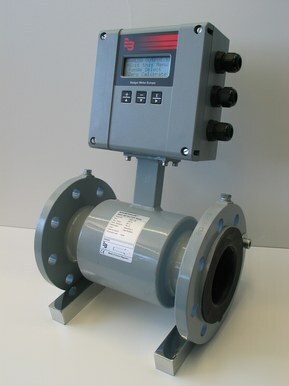 In most flow measurement devices, the transducer is positioned directly on top of the transmitter. There are also devices in difficult to reach environments where the transmitter and transducer are positioned far apart. In these situations, UNITRONIC® CY PIDY (TP) data cables ensure the safe transport of signals that are susceptible to interference. The UNITRONIC® CY PIDY (TP) offers double protection – single screened pairs of wires and, additionally, an entirely copper-screened network. It is also flame-retardant in accordance with IEC 60332-1-2. UNITRONIC® CY PIDY (TP) is suitable both for fixed installations and for flexible uses in dry and damp areas. Badger Meter Europe GmbH is a wholly owned subsidiary of Badger Meter Inc., based in Milwaukee, USA. in numerous areas of flow measurement technologies, which is documented by the many patents in the company’s name. Flow measurement systems made easy! The SKINTOP® CLICK cable gland systems offered a low-cost and timesaving production variant. Just click and turn and the cable is locked, centred, protected against vibrations, optimally strain relieved and hermetically sealed. For customers this means: a time saving of up to 70% for assembly, meaning lower costs and more competitiveness. The UNITRONIC® CY PIDY (TP) data line was used to connect the measuring devices. It consists of individually shielded twisted pairs, an overall copper braid and is also non-flammable. This means that data is optimally protected from outside influences. SKINTOP® CLICK cable glands. In this particular case, SKINTOP® CLICK-R version with reducing seal insert for smaller clamping areas. Also, UNITRONIC® CY PIDY (TP) to transfer sensitive measuring signals to external measuring transducer.